Prepare a panel with the lyrics. 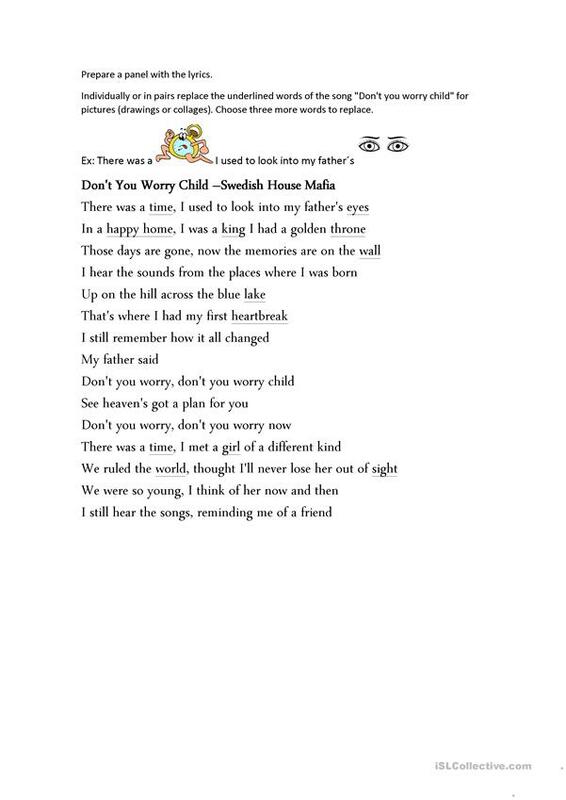 Individually or in pairs replace the underlined words of the song "Don't you worry child" for pictures (drawings or collages). The present downloadable printable is best suited for high school students and elementary school students at Elementary (A1) level. It is valuable for practising Word formation in English, and is useful for enhancing your learners' Reading and Writing skills. It centers around the theme of Actions. arjvgh is from/lives in Brazil and has been a member of iSLCollective since 2012-09-27 21:19:04. arjvgh last logged in on 2018-06-12 17:00:25, and has shared 7 resources on iSLCollective so far.